Tina is a triplet, but she’s always been the odd one out. Her sisters Phil and Maddie are bigger and stronger and better at just about everything. Luckily, they look after teeny-tiny Tina wherever they go – but when the girls start in scary, super-strict Miss Lovejoy’s class, they’re split up, and Tina has to fend for herself for the first time. Tina is horrified when she’s paired up with angry bully Selma, who nobody wants to be friends with. But when Miss Lovejoy asks them to help her create a butterfly garden in the school playground, Tina discovers she doesn’t always need her sisters – and that there’s a lot more to Selma than first meets the eye. The Butterfly Club is a really good book and a really good story on making new friends. With some nice and mean characters. It is a really good animal story too with lots of illustrations. But will small Tina be able to cope with mean Selma and Kay-Leigh, will Mrs Lovejoy easy down on Tina or will she just have to fend for herself for the next year. My personal favourite part is when Bully Selma takes a rough turn, will it stay permanently that way. Another part is when her Mum gets a bit worried about the beginning of the Butterfly garden, will Tina and Selma be able to raise enough money to get all the flowers for there garden? What will happen to all there hard work… One sad part is when Tina’s sisters Philippa and Madeline will not except Selma as part of their life. Tina`s just about to give up all her hope on the butterfly garden when the first one appears but will Tina still carry on believing that more Butterflies will come or shall she just give up! Find out in this brilliant book. 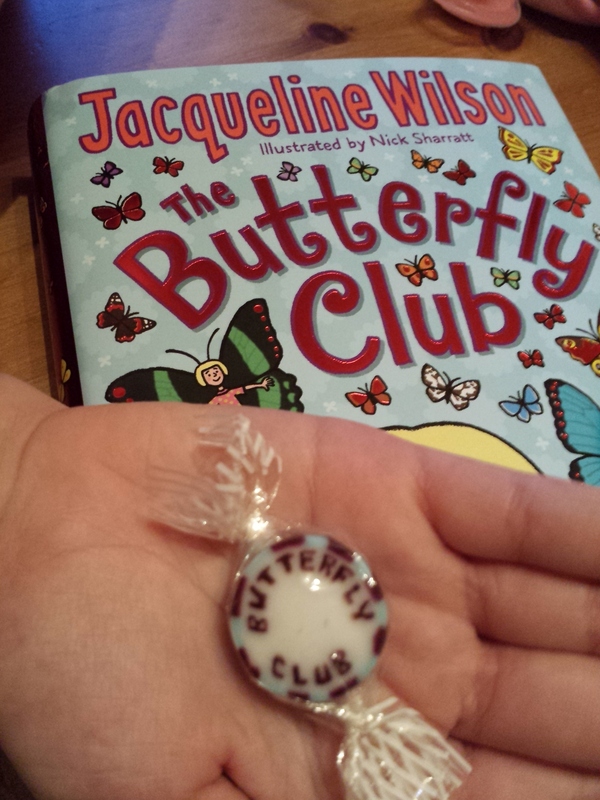 I loved the Butterfly Sweets that came with the book! 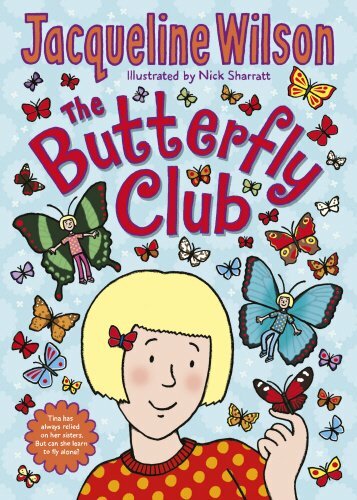 Finally a big thanks to Jacqueline Wilson the author of this brilliant book, also congratulations seen as The Butterfly Club is your 101st book and another big thanks to Nick Sharrett the illustrator of this brilliant book. 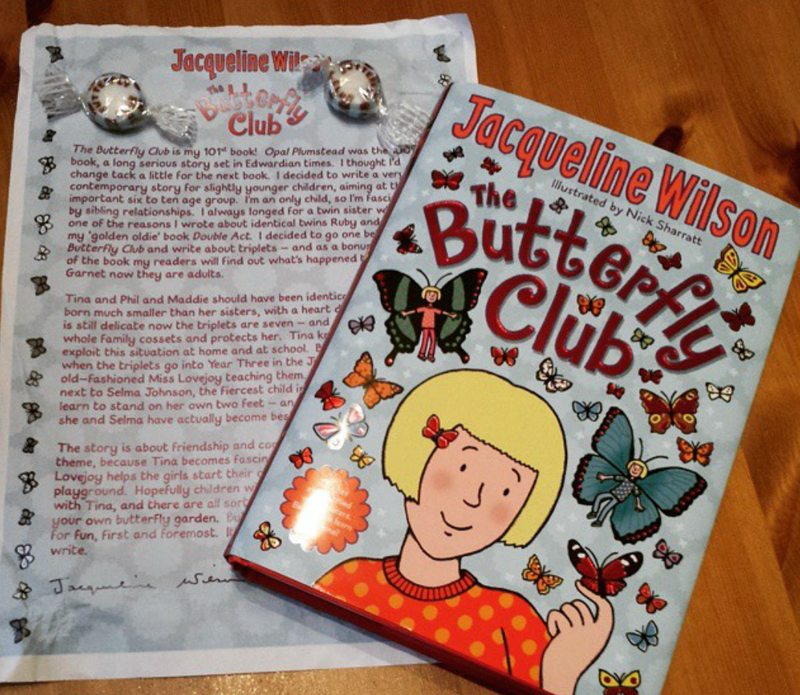 The Butterfly Club is Jacqueline Wilson’s 101st novel, a beautiful, heart-warming story about friendship, confidence and becoming your own person, perfect for committed fans and as an introduction to Jacqueline’s books. Tina is a triplet, but she’s always been the odd one out. Her sisters Phil and Maddie are bigger and stronger and better at just about everything. Luckily, they look after teeny-tiny Tina wherever they go – but when the girls start in scary, super-strict Miss Lovejoy’s class, they’re split up, and Tina has to fend for herself for the first time. Tina is horrified when she’s paired up with angry bully Selma, who nobody wants to be friends with. But when Miss Lovejoy asks them to help her create a butterfly garden in the school playground, Tina discovers she doesn’t always need her sisters – and that there’s a lot more to Selma than first meets the eye. Dame Jacqueline Wilson is a former Children’s Laureate and a multi award- winning, best-selling author who has recently been revealed as the most borrowed author from public libraries of the past decade. Over 35 million copies of her books have been sold in the UK alone and her books have been translated into 34 different languages. The Butterfly Club is her 101st novel. The critically acclaimed and hugely successful stage adaptation of Hetty Feather which toured the UK last year will return for a further West End run and UK tour in 2015. Dates will be announced soon. Fans of Hetty Feather will be well provided for in 2015 as a major BBC TV adaptation of the book is currently scheduled to air later this year. I have never seen a book glued to my child’s hand like i did with this book! It went everywhere with her, school, car journeys, even the hairdressers!! Very proud of Amy-Lee’s first ever book review 🙂 here’s to many many more!